Our Salesforce Best Practice of the Week is how to close a lot of Salesforce Tasks. How many times have you found yourself with a long list of Salesforce tasks that have been completed but never closed? Just thinking of the time required to go into each task and close it will drive a person into apathy. The list just keeps getting longer and longer. So, you ask your Salesforce Administrator if there is a way to mass close Salesforce tasks. Unfortunately, mass editing the Task “Status” field in a list view is not supported. In fact, few activity fields can be edited in a list view. Your admin could export your task ID’s and mass update them that way but this is still time-consuming and your admin may not know what tasks to close. So the question of “How to close a lot of Salesforce tasks?” remains! The last thing you want is having a task closed that causes you to forget something! In our campaign to help simplify Salesforce for end users and administrators, we would like to pass along a tip that will show all end users of Salesforce Enterprise edition how to close a lot of Salesforce tasks by giving them the ability to mass close their own tasks. With the help of your administrator, or our Salesforce Administration Support Service, your end users will be in Salesforce task closing ecstasy. First, the Salesforce Administrator prep work: Create a custom field, a Workflow Rule, a Field Update, and an Activity List View. In Salesforce Enterprise edition, go to Setup | App Setup | Customize | Activities | Activity Custom Fields and create a new Checkbox field like the picture below. Be sure to make it visible and editable for all profiles that will need to use it and place it on the Task page layout. If it is not on the Task page layout, it will not be editable later in the list view. Now go to Setup | App Setup | Create | Workflow & Approvals | Workflow Rules and create a new rule. Select “Task” as the object, click “Next” and set the criteria per the picture below. As a best practice, always use the “Description” field so you know what something is used for a year later. Click the “Save & Next” button to add your action to the workflow. Use the “Add Workflow Action” button on the next screen to select “New Field Update”. Populate the field update like the picture below. Don’t forget the Description field. Click the “Done” button once the field update has been created and then click the “Activate” button back on the workflow page to turn it on. That’s it for the administrator work but you may want to make one list view for your users as a courtesy. The following can now be performed by any end user to create their list views. The steps below show how to create one list view for all users so there are some admin steps that an end user will not need to perform. For more information on List Views, please see our Salesforce List Views Tips blog. Go to your Home tab in Salesforce and click the Activity List View button under your calendar. (Picture below). Create a new view in Salesforce.com and call it something like “Close Tasks”. For administrators, use the “My Activities” option (picture below) and set the visibility options to all users or certain groups of users. This allows any user to use this view and only return their tasks. 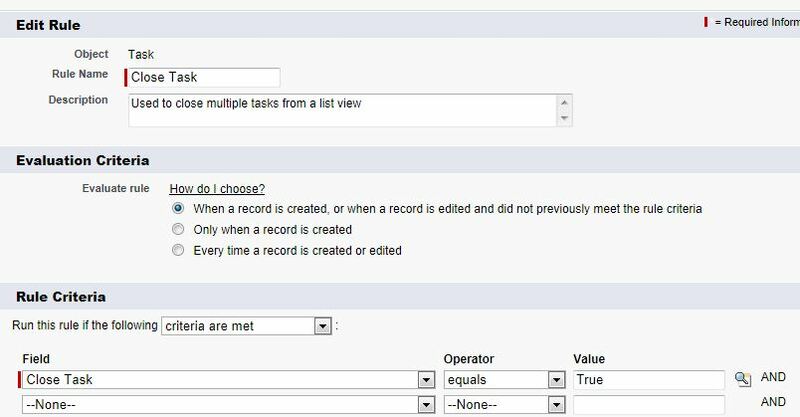 As with any Salesforce activity view (or a list view on any object that uses record types), in order to enable mass editing in the list view, you must specify the type or record type. In the criteria above, Task must equal true for tasks or false for events. Then add the second criterion of Closed equals False to only show open tasks. Be sure to add the “Close Task” field in the “Select Fields to Display” section. Save it and you (or your users) are now ready to mass close tasks in Salesforce. 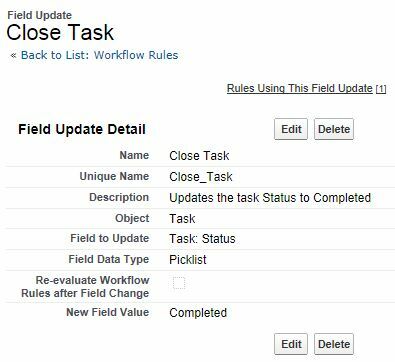 In your new Salesforce list view, select the tasks you want to close by checking the boxes in the left Action column (picture below). You can select up to 200 at a time and they do not all have to be on the same page or in order. A little counter at the bottom left will show you how many records you have selected. Hover your mouse in the “Close Task” column over a selected row and a pencil icon should show up like the picture above. If the pencil icon does not show up, ensure that your administrator has placed the field on the proper page layout. A field can be in a list view without being on the page layout but it must be on the layout if you want to mass edit it. Double click where you have the pencil icon to bring up the edit screen (picture below). Select your choices and click the “Save” button. You will be returned to your Salesforce list view and you may see your selected records change from yellow to blue as the changes are being applied. Once applied, click the Refresh button to clear your previous selections (picture below). Notice in the picture above that the selected records all have the “Close Task” boxes checked but their Status has not changed. Hit the Refresh button and the view changes to reflect your edits (picture below). That’s it! 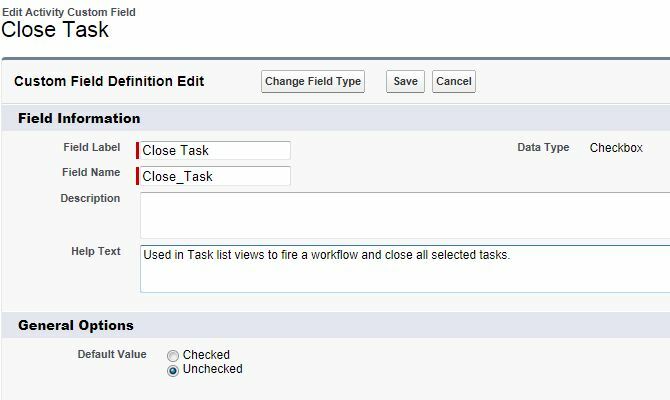 Now you know how to close a lot of Salesforce tasks: you can come back to your list view any time to mass close any old Salesforce tasks. Want more Salesforce tips like this one on How To Close A Lot of Salesforce Tasks?